This has been an extremely fun comic from the beginning, but I hate to tell ya, it falls all to pieces in this last issue. When we last left our heroes, they were stuck in the Mojoverse, time-diamonds stuck all over them to allow them to fight the Czar and Big Murder, when Wolverine gets possessed by the Phoenix Force. And this issue starts out with… Spidey, Wolvie, and Spidey’s new girlfriend living quietly in the Old West. 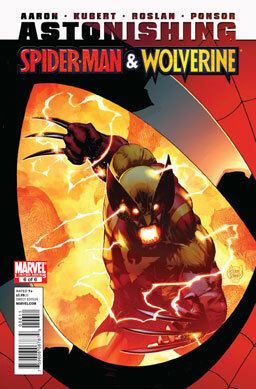 Oh, and we eventually find out that Spidey defeated WolverPhoenix by… talking him down. Then mysterious portals steal the bad guys away, and after a while of, again, living quietly in the Old West, the time portals come back and we learn they’re run by the Time Cops, and they steal the heroes away, stuff ’em back in the present day, make Spidey’s girlfriend forget him, and everything ends on a deeply depressing note, where everyone’s efforts were completely useless and the heroes are left alone and lonely. Verdict: Thumbs down. Seriously, it’s amazing how a series that was so very awesome for the first five issues just turned into a bucket of missed opportunites, illogical wrapups, and pointless nihilism in the final ish. At least the art was gorgeous. How to improve this series: Well, the series is over now, but I definitely would’ve started out with Spidey stopping WolverPhoenix in some way other than just talking his ear off. I also would’ve loved to see an ending that didn’t rely on deus ex machina like the Time Cops and maybe didn’t try to be so relentlessly downbeat. Derek Dynamo and Super Dinosaur head out after the evil Max Maximus, unaware that he’s tricked them into pursuing Tricerachops and her master, a masked maniac called the Exile. And because the battle is going to take place in the Arctic, SD has to wear his special cold-weather armor. There’s a great deal of fighting and punching and missile-launching and suchlike. Verdict: Thumbs down. I hate to say it, but it bored me. 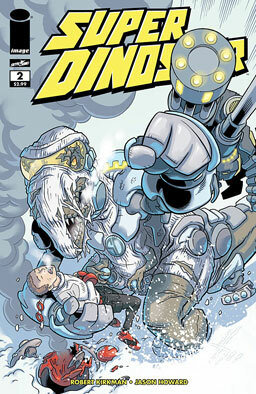 I know, what the heck is wrong with me when a comic book about a talking, armored T-rex won’t entertain me?! How to improve this series: Well, for starters, I’m already feeling weighted down by a bunch of new characters who I’m not real familiar with yet. This series started out with a pretty large supporting cast, for an all-ages comic, and they’re already adding more villains. Jeez, guys, I can’t keep track of the people who are already there! Hal Jordan is wearing a yellow power ring, and Guy Gardner is wearing a red one, because the rest of the Green Lantern Corps has been taken over by Krona and mind-controlled into a bunch of lunatics. And a bunch of the Guardians have become hosts for the emotional entities. 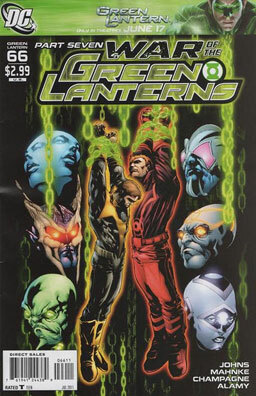 Sinestro is trying to escape from the Book of the Black, but Hal and Guy have been captured already, and Krona plans to turn them into Guardians, too. Verdict: I must not be in the mood to like anything today, because this was a big thumbs down. I’m just completely tired of Geoff Johns’ endless, senseless, long-running mega-series. Plus, I was absolutely bored the entire time I was reading it. Oh, and I found out they actually blew up Mogo, the awesome sapient planet that’s a member of the Green Lantern Corps, in one of the other Green Lantern series, so I’m not real happy about that either. How to improve this series: Stop letting Geoff Johns write it. Get away from the unending focus on boring cosmic stuff. Don’t blow up Mogo. I doubt any of that stuff is going to happen, so I may be giving this series up. Snell does some fun geographical figurin’ to try to pinpoint the location of Gotham City. If you play the “Munchkin” card game, you may be interested to hear that they’re going to be publishing a Conan the Barbarian booster set. Here are some beautiful photos of deserted buildings. Oh, man. That review of ASTONISHING SPIDER-MAN AND WOLVERINE is just…just heartbreaking. Aaron has been on such a huge roll lately, I just kind of expected him to knock that one out of the park. THEY BLEW UP MOGO?!?! Man, that is eff’d up. I am…very disappointed in DC right now. It’s AMAZING how badly comic companies handle properties when a movie’s about to hit. Just shameful, really. The constant shouts of “AWESOME” in Super Dinosaur kinda rub me wrong, too. Show, don’t tell, Mr. Kirkman. I miss John Stewart: pacifist. And WHO retconned him to have a military background? IIRC, your friend and mine, Mr. Geoff Jones. I don’t blame you for wanting to drop it, dude. All the fun and wonder has been sucked out of that series. Actually, I think the Marine background originated in the “Justice League” cartoon and was retconned into the comics. I actually think that Geoff Johns’ long-reaching story arcs in the Lantern books have been some of the most awesome and enjoyable stories to come out of comics in a long time.